A Lebanese specialty, creamy hummus is topped with hushwee, a cinnamon-scented meat and pine nut mixture, then served with warm pita bread. 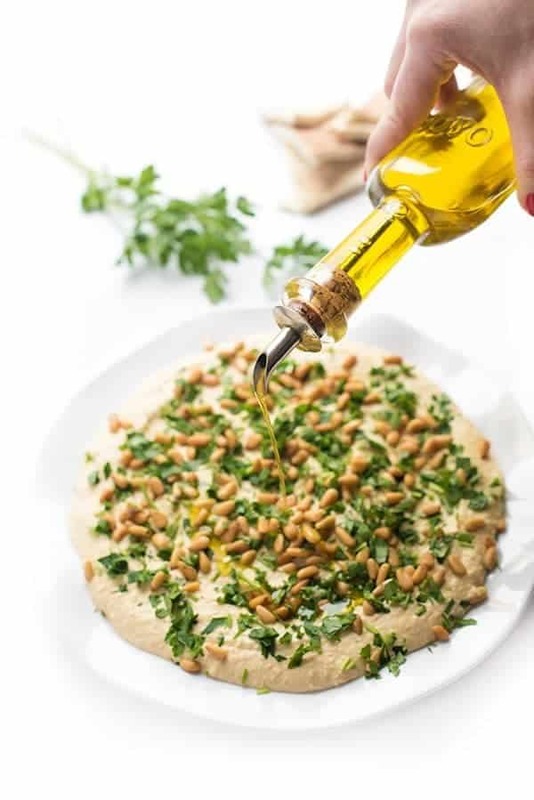 If you love hummus then you are going to love this traditional Middle Eastern appetizer which takes it to the next level. 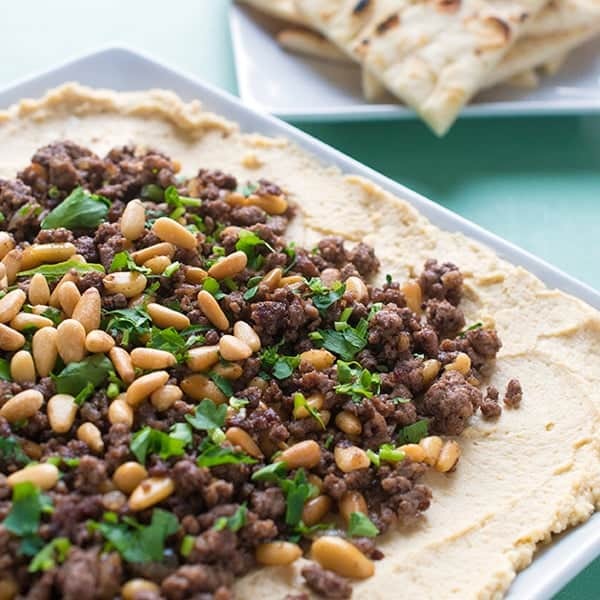 Hummus with Lamb and Pine Nuts is the combination of traditional, creamy hummus topped with hushwee – a ground meat and pine nut mixture. Hushwee is traditionally made with ground lamb or sirloin and is seasoned with my Lebanese All-Purpose Spice Blend made with cinnamon and ground allspice. 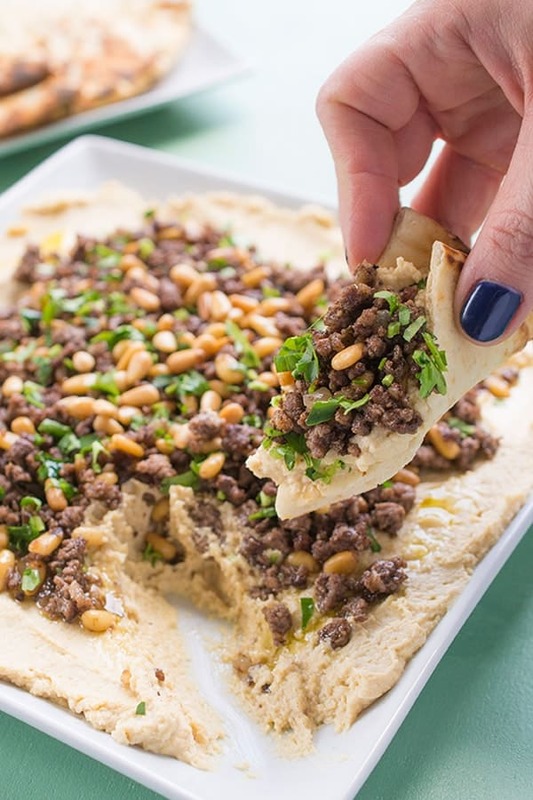 The greatest part about this recipe is that the hot meat and pine nut mixture slightly heats up the hummus which is actually how it is meant to be served: warm, not cold. Just like a tomato tastes better at room temperature, hummus tastes better when it isn’t fully chilled. Serve with warmed pita bread and a giant Lebanese salad and dinner = done. Spread hummus in a thin layer on a large platter and set aside. Melt clarified butter in a deep skillet over medium-high heat then add lamb to the pan. Begin browning the lamb using a wooden spoon to break up into bite-sized pieces. After about 5 minutes, when the lamb is still partially cooked, stir in the onion and spices. Continue sautéing, stirring frequently, until onions are translucent and lamb is fully cooked through, about 12-15 minutes. Remove pan from the heat and stir in the pine nuts. Check for seasoning and adjust accordingly. 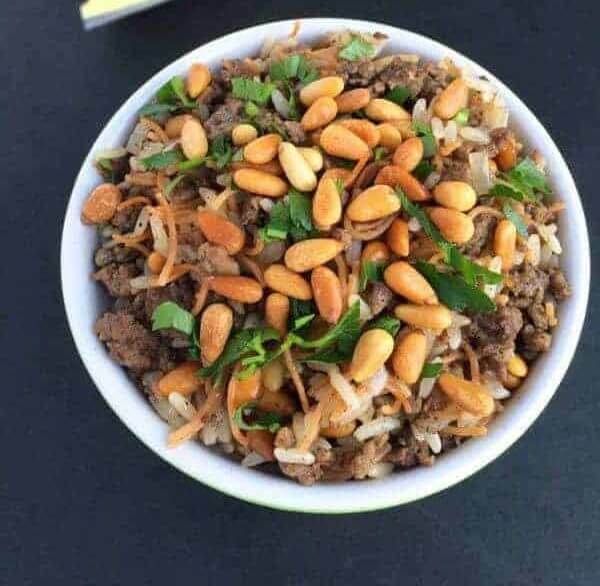 Spoon warm lamb and pine nut mixture over the hummus and sprinkle with fresh parsley. Serve with warm pita bread for scooping. Need a few more Healthy Appetizers for your next party? 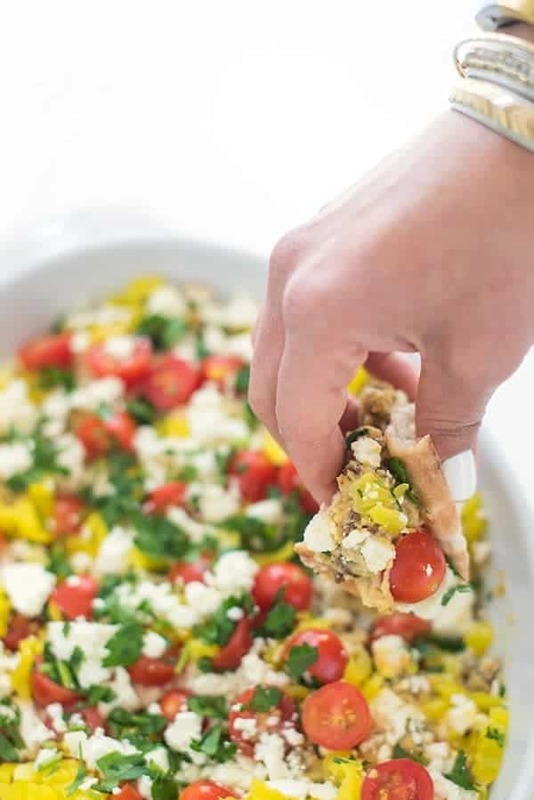 Follow The Lemon Bowl | Liz Della Croce’s board Healthy Appetizers on Pinterest. I’m so glad to hear you enjoyed it Alka!! Let me know if you try any of my other Lebanese recipes! I made this last week – so easy and tasty. Bound to become a regular thing …. Do you think it will work with chicken? I think that’s a sign you should make it! this is AWESOME!!! my Hubby would love this! Pinning now! Thanks for sharing!! Would this recipe work with beef instead of lamb? I ended up finding pine nuts at another store.., this recipe was a total HIT at a dinner party! So simple to make and delicious! Thanks for the recipe!! Oh I’m so glad!!!! Enjoy!! Looks so good! The store was out of pine nuts, would walnuts, almonds or pepitas work as a substitution? You know I bet walnuts would be good but to be honest we only ever use pine nuts. I typically buy them in bulk at Costco and freeze them. Oh goodness. I’d eat all 8 servings by myself! Ummm… it would be totally worth it if you did! HAVE FLIPPING MERCY!!! I am making this next week on Spring Break, holla! HOLLA!!!!! I heart you and miss you.